12 August 1914: Entered the Army as a Fahnenjunker in the II. Replacement Battalion of Royal Saxon 4. Feld-Artillerie-Regiment Nr. 48. 6 February 1915: In the field with Field Artillery Regiment 48. 10 August 1915-16 August 1915: Detached to the Gas Course in Leverkusen. 16 May 1916: Wounded/in hospital. 6 July 1916: Allocated to the II. Replacement Battalion of Field Artillery Regiment 48. 21 August 1916: In the field with Field Artillery Regiment 48. 15 August 1917-7 December 1917: Adjutant of the I. Battalion of Field Artillery Regiment 48. 26 January 1918-20 February 1918: Detached to the Firing School at Remberlow. 20 December 1918: Court Officer and Board of the Mobilization Detachment of the II. Replacement Battalion of Field Artillery Regiment 48. 19 August 1919: Regimental Adjutant of the Timed Volunteer Field Artillery Regiment 48. 10 December 1919: Transferred to Reichswehr Artillery Regiment 12. 20 October 1920: Detached to the 4th Transport Battalion. 1 January 1921: Transferred to the 4th Transport Battalion. 1 February 1921-27 February 1921: Detached to the Signals Course at the 4th (Saxon) Signals Battalion. 1 October 1922: Transferred to the 4th (Saxon) Medical Battalion. 20 September 1923-19 October 1923: Detached to the Firing Course in Königsberg. 11 November 1924-26 November 1924: Detached to the 4th (Prussian) Pioneer Battalion. 1 February 1925: Returned to the 4th Transport Battalion. 1 June 1926-31 July 1926: Detached to the Transport- and Equipment Course in Hannover. 1 October 1926-20 February 1927: Detached to the Officers Weapons School Course in Dresden. 1 October 1927: Battalion Adjutant of the 4th Transport Battalion. 1 October 1929: Transferred to the 6th Battery of the 4th Artillery Regiment. 25 September 1930-5 November 1930: Detached to the Firing Course for Artillery Officers in Jüterbog. 1 October 1930: Hauptmann on the Staff of the II. Battalion of the 4th Artillery Regiment. 1 October 1931: Chief of the 5th Battery of the 4th Artillery Regiment. 1 April 1934: Adjutant of Artillery Leader IV. 15 October 1935: Commander the I. Battalion of Artillery Regiment 14. 29 July 1937-27 August 1937: Detached to strengthen the Demonstration Staff of the Jüterbog Artillery School. 1943: Delegated with the leadership of Grenadier Regiment 7 of the 252nd Infantry Division on the Eastern Front. 9 June 1943: Army High Command Leader Reserve. 12 September 1943: Delegated with the leadership of the 36th Infantry Division on the Eastern Front. 20 September 1943: Delegated with the deputy leadership of the 8th Panzer Division on the Eastern Front for the duration of the absence of the divisional commander (Generalleutnant Sebastian Fichtner). 5 November 1943: Delegated with the leadership of the 8th Panzer Division on the Eastern Front. 1 April 1944: Army High Command Leader Reserve/in hospital. 20 July 1944: Commander of the 8th Panzer Division on the Eastern Front. 22 January 1945: Army High Command Leader Reserve/in hospital. 18 March 1945-9 April 1945: Leader of Corps Group “von Tettau” (named after the former corps commander, General der Infanterie Hans von Tettau) in Pomerania on the Eastern Front. 10 April 1945-2 May 1945: Higher Artillery Commander (Harko) 313 of the 3rd Panzer Army (General der Panzertruppe Hasso von Manteuffel) on the Eastern Front. 2 May 1945-19 May 1945: Prisoner of war in British captivity. 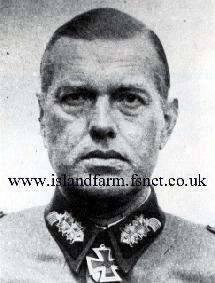 Knight’s Cross of the Iron Cross: 20 December 1943, Oberst, Commander of the 8th Panzer Division. German Cross in Gold: 2 January 1942, Oberst, Commander of Artillery Regiment 78. Saxon Military St. Henry Order, Knight’s Cross: 15 April 1918.